Senior Lecturer in Adult Nursing and Midwifery. Sheila’s nursing and midwifery career began when she trained as a nurse at The London Hospital, Whitechapel. Following qualification she became a staff nurse on a chest/vascular surgical ward before commencing children’s nursing at The Hospitals for Sick Children, Great Ormond St.
To fulfil a desire to become involved in development work overseas she trained as a midwife and after a short period worked with VSO (voluntary service overseas) as a midwifery clinical teacher in Sierra Leone – a fantastic period of her life. 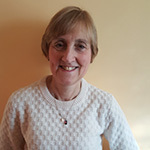 Upon return to the UK she was employed as a staff midwife, a midwifery co-ordinator, a lecturer practitioner and since August 2017 a senior lecturer at LSBU. She is linked to Barking Havering and Redbridge University Trust and temporarily to Barts Health – Newham University Hospital. Areas of teaching include all practice based midwifery skills and theory linked to mentorship, anthropology, sociology and psychology. Sheila gained a Masters qualification in Medical Anthropology in 2007 and Senior Fellowship in 2016. Sheila is currently the lead lecturer for student Elective Placements. Sheila attends various conferences including the International Confederation of Midwife’s triennial conference in Toronto, Canada in 2017.